The center of the storm is expected to pass near Bermuda on Friday, and a dangerous storm surge is expected to produce “large and destructive waves” along with significant coastal flooding. Michael Dunkley, Bermuda’s premier, joined Bermuda Weather Service officials to provide residents with an advisory on Hurricane Gonzalo late Wednesday. The Bermuda Tourism Authority (BTA) is closely monitoring the storm and officials expect Bermuda’s L.F. Wade International Airport to close by 9 p.m. on Thursday and remained closed through October 18; extra flights are departing the island in advance of the storm according to local press reports. Air Canada, American Airlines, WestJet, JetBlue and United Airlines are all said to be adding additional flights. U.S. Airways will utilize a larger aircraft for its scheduled service to Philadelphia. The Tourism Authority is working to request that airlines waive change fees for travelers impacted by the storm, and the Bermuda Hotel Association has put its hurricane cancellation policy into effect. 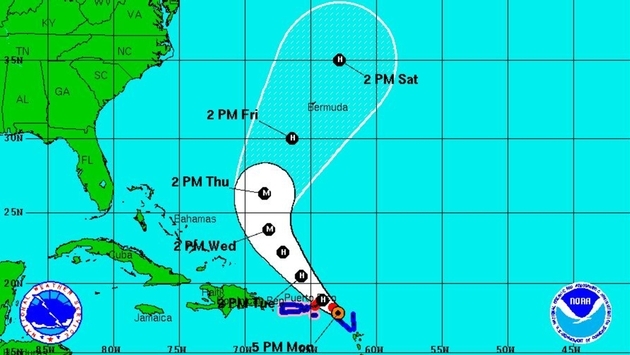 BTA is recommending visitors with plans to travel to Bermuda in the next five days consider postponing their travel until a later date. The Bermuda Weather Service is predicting the hurricane will match Fabian in 2003 in terms of its impact, with strong winds expected to impact the territory for up to 27 hours.